From left, Kentucky 6th congressional district candidates Republican Rep. Andy Barr and Democratic challenger Amy McGrath. It is a scene playing out across America as the crucial Nov. 6 congressional elections edge closer – biting attack ads portraying Republican incumbent politicians as unworthy of re-election. With upbeat background music, the announcer on the Democratic-financed digital ad tells voters in the heartland of America that GOP Congressman Andy Barr accepted more than $2 million in campaign donations from special interests and voted for “the disastrous health care plan” advanced by Republicans that senior citizen advocates contend will cost retirees more than that paid by younger people. The Democratic political action committee ad was designed to soften up Barr for McGrath’s own attacks and campaign advertising. A Democratic conquest of the House this fall could pose significant problems for Trump in the last two years of his first term, with Democrats likely to call for widespread investigations of his administration’s actions and possibly embark on impeachment hearings over alleged links between the 2016 Trump campaign and Russia, and interference with special counsel Robert Mueller’s criminal investigation. Many Democratic challengers are attacking Republican incumbents on two key issues – their support for repealing national health care policies that have proved popular, and cutting taxes that Democrats say mostly benefit the country‘s corporations and wealthiest taxpayers at the expense of the middle class. Barr supported the health care repeal and the tax cuts. Republicans failed numerous times during the first months of Trump’s presidency to repeal the 2010 national health policies championed by former President Barack Obama, Trump’s Democratic predecessor. Republican lawmakers, when running for Congress two years ago, often said their first mission when they held majorities in both chambers of Congress would be to repeal and replace the law popularly known as Obamacare. Trump, through executive orders, has chipped away at some of the law’s provisions, and Congress eliminated a provision requiring that virtually all Americans buy health insurance or pay a fine. In some urban, liberal strongholds, the progressives’ views could prove decisive in House elections, but their positions have yet to gain widespread national prominence. 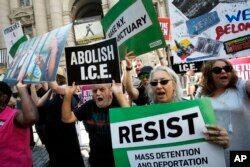 As border immigration disputes dominated the airwaves in the U.S. in recent months, some liberal Democrats also advocated shutting down the country’s Immigration and Customs Enforcement (ICE) agency, but the idea quickly seemed to fade. Republicans are not without political ammunition in trying to defend their majorities in Congress, as they point to strong economic growth in the U.S. that has occurred during Trump’s tenure and low unemployment. But Republicans are also arguing that Democratic control in Congress would upend Trump’s conservative proposals. “Who is Amy McGrath?” the Barr ad asks. “Hell yeah, I’m a feminist,” McGrath says. “I consider myself a progressive. I am pro-choice. I voted for Barack Obama." The ad notes she also voted for Democrat Clinton in the 2016 presidential election, whom Trump soundly defeated in the 6th congressional district en route to winning the White House. “Amy McGrath: Too liberal for Kentucky,” the ad concluded. While the back-and-forth political claims of Barr and McGrath may be standard political fare in the U.S., independent political analysts think that in many congressional districts, such as Kentucky’s 6th and in the one-third of U.S. states where Senate races are being contested, there is an even bigger issue in the 2018 elections. 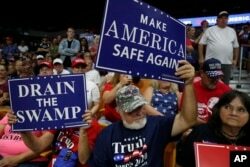 The question is whether Republican voters that national polls show overwhelmingly support Trump’s White House performance turn out to vote in sufficient numbers across the country to keep Republicans in control of Congress. Or will Democratic opposition to all things Trump – his political stances, his rants on Twitter, his unpredictable relations with world leaders -- and their apparent zeal to rebuke him turn the electoral tide against the U.S. leader? Alan Abramowitz, a political scientist at Emory University in Atlanta, also says Democrats “have a good chance of taking over the House,” possibly picking up 30 to 40 seats, while it is “certainly a longer shot” to claim Senate control.